• Spectrum-analyzer 950-2150MHz. • DVB/S S/2 -receiver 920-2150MHz. 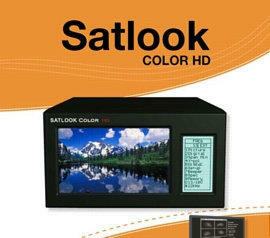 • Super bright 5” 16:9 TFT-LCD color display. • Automatic Satellite identification. • Readout of NIT - gives SAT ID and TV/Radio-channel info. • Digital BER and S/N-ratio (DVB-S, S/2). • QPSK and 8PSK constellation diagram. • DVB-S (Free to Air) and SAT-analog TV-picture. • LNB voltage 13/18V, 22KHz tone switch. • DiSEqC according to level 1.0, 1.1 and 1.2. • SatCr-control (UniCable). • Favourite channel list (100 channels) for FTA DVB-S. • Lots of memory positions for spectrum pictures. • RS232 for PC-connection (up/download). • Rechargeable Li-Ion battery. Input frequency: 920-2150MHz. Sat-TV min level in: About 35 dBuV (noise). Sat-TV max level in: About 90 dBuV. Sat-TV attenuation: 15 dB attenuator on/off. Display of signallevel (analog): dB on LCD/monitor. Pitch-tone. Sat-TV accuracy: ±1½ dB (at +20° C). DVB-S S/2 Digital display of signallevel: S/N (signal/noise-ratio) BER (bit error rate) Constellation (QPSK and 8PSK). Satellite-indentification: Yes, by reading out the NIT in the Bitstream. Info about the TV and Radio channels. TV standard: Multi TV/ (PAL, NTSC, SECAM). KU- C-band: Yes, selectable. Input impedance: 75 Ohm, BNC-con. Picture-screen: 5” 16:9 TFT-LCD monitor Menus: On LCD 64x128. Memory: - Lots of spectrum pictures can be stored with name. Stored spectrum can be mixed for easy identification of satellite. -“Maxhold”-function. Favouritechannels: Both analog and digital frequencies can be stored (with name). 100 DVB-S Free to Air channels can be stored in a favourite channel-list. PC-connection: RS232-output and PC-software. Sat-TV power out: Yes, 13-18V. Sat-TV control: 22 kHz, DiSEqC SatCr (UniCable). DiSEqC: Yes, all 1.0 and 1.1. 1.2, Toneburst on/off. DiSEqC actuator: Built in positioner for DiSEqC 1.2, Battery: Rechargable 12v, 3.5 amp/hour. Weight: About 4 kg incl. battery. Accessories: Nylon carrying-case. Power-supply of 220v/13.5v, 1.7amp. F-adapters.